Attorney – Makris Law, P.A. Dean Makris was born and raised in New Port Richey, Florida and has proudly called the Tampa Bay area his home since birth. He grew up playing sports such as soccer, basketball, and tennis. This is when Dean gained his competitive spirit. He graduated from J.W. Mitchell High School and went on to attend his undergraduate studies at the University of South Florida. At USF, Dean earned a Bachelor’s Degree in Finance with a minor in Economics. Thereafter, Dean enrolled in law school at Stetson University College of Law where he graduated in the top of his class. 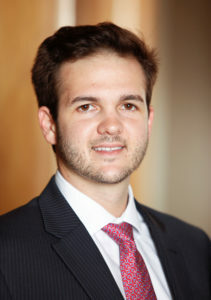 During law school, Dean interned with an international franchise company headquartered in Tampa, and additionally, was a judicial extern for the Honorable Virginia Hernandez-Covington of the United States District Court for the Middle District of Florida. Most notably during law school, Dean clerked for one of the largest property insurance claim law firms in Tampa, Florida helping homeowners obtain what they were rightfully entitled to from their homeowner insurance carriers. This experience continued on as an attorney. As an attorney, Dean has helped many many homeowners and commercial property owners with their insurance claims from submitting a claim to their insurance carrier through resolution. Unfortunately, litigation is often required to get you what you are entitled to from your insurance company. However, Dean has years of experience in litigating insurance claims in Court against some of the biggest insurance companies, and has ultimately obtained successful resolutions for his clients. Dean prides himself on his competitive spirit to win and help others, and his relentless work ethic. For these reasons, Dean has decided to stay in his hometown and fight for the people against the big insurance companies. Dean is a member of the Florida Bar, and is licensed to practice law in all Florida state courts, as well as, the Southern and Middle District federal courts in Florida.